NEW YORK (Sputnik) — The thirteenth round of US-EU negotiations on the Transatlantic Trade and Investment Partnership (TTIP) has started in New York City on Monday and will continue through the week. The latest round of talks, which began in 2013, will bring together chief negotiators from the EU and the United States in an attempt to reach an agreement on the TTIP deal, which would reduce barriers to trade in goods and services between Europe and its largest export market, the United States. Various stakeholders who support or oppose the deal will have the opportunity to address chief negotiators through various forums throughout the week, according to the Office of the US Trade Representative (USTR). The TTIP deal has drawn criticism from the public for the lack of transparency in its negotiations and the power it would give to international corporations. It has also been slammed for bypassing the framework of the World Trade Organization and excluding BRICS countries. Leaked details of the deal show that it might undermine environmental, health, safety and labor standards. 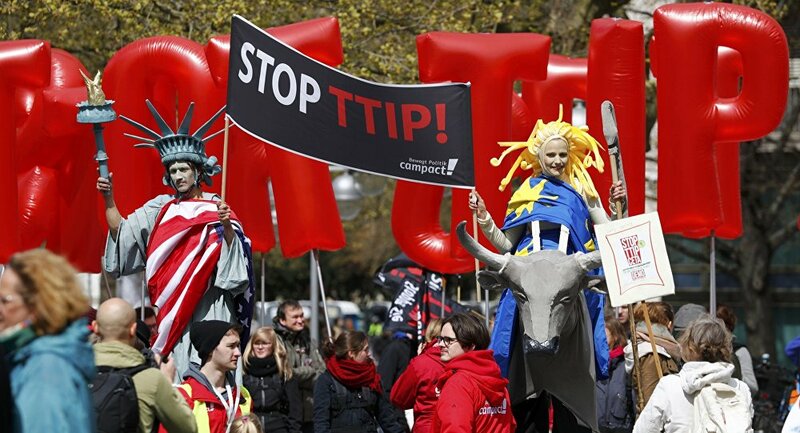 A European-wide petition against TTIP has already been signed by three million people. Some 1,400 European municipalities have declared their opposition to the deal, mainly in Germany, France, Austria and the United Kingdom. Meanwhile, the USTR labeled the TTIP deal as "an ambitious, comprehensive, and high standard trade and investment agreement" that will "help unlock opportunity for American families, workers, businesses, farmers and ranchers through increased access to European markets." On Sunday, US President Barack Obama met with German Chancellor Angela Merkel amid US and German efforts to lend momentum to the TTIP negotiations, so that the draft of the full text of the agreement could be finalized before the end of the year. The latest round of negotiations in New York City is scheduled to conclude on Friday, April 29.